Adjust the Circles Radius slider to increase or decrease the size of the circles on the Transpose line. Turn off the 3D radius option if you wish the Transpose line circles to remain at the same size and not be adjusted with perspective. The Axis Length slider sets the length of the red X, green Y and blue Z axis lines on the Transpose line. The Show Alignment Dial makes the white alignment circle at the end of the Transpose line visible or invisible. Clicking this white circle will align the Transpose line on the center of the visible mesh portion. When drawing the Transpose line the ends of the line snap to the surface under or near to the cursor. When the cursor is over the canvas background, the Snap Max distance determines how far it can be from the model and still snap a Transpose line endpoint to the model’s surface. The Rotation Steps slider allows the number degrees that the Transpose line will snap to while holding Shift and rotating. A setting of 10 means the line will snap every 36 degrees. When masking a mesh, the Mask Blur Strength slider determines the amount the mask edges are blurred when Ctrl+clicking the mesh. Higher values result in more blurring. When masking a mesh, the Mask Sharpen Strength slider determines the amount the mask edges are sharpened when Ctrl+Alt+clicking the mesh. Higher values result in more sharpening. When the Align Actionline to Axis button is pressed, ZBrush will always keep your Transpose Line on the same axis as the drawn point. This will always make sure to keep a straight line. With the option turned off, the Transpose Line will be drawn between the closest mesh points to the beginning and end of your stroke. 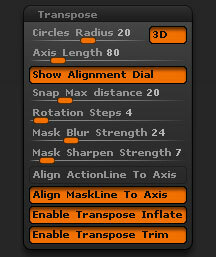 When applying a mask with the Transpose line, if the Align MaskLine to Axis option is on then the line will always be aligned to a single axis. The Enable Transpose Inflate will activate the 3rd red circle to allow inflation when holding the Right mouse button and click+dragging. The 3rd red circle is the one furthest from the mesh. The Enable Transpose Trim will activate the 1st red circle to allow flattening when click+dragging the circle. The 1st red circle is nearest to the mesh.